Many of us have been a victim of theft and it’s no laughing matter. The pain of losing money, documents and credit cards hardly seems worth the hassle and we certainly can’t all be carrying around locked briefcases with a handcuff tied to the wrist. That’s why the guys at Loctote created the Flak Sack; a comfortable fabric thiefproof tote bag. The Flak Sack is created out of a double-layer of Cut-Tex Pro which is comprised of a blend of high molecular weight polyethylene and other cut-resistant fibers. This material was originally developed to be used in body armor and features some of the highest possible cut resistance, abrasion resistance and tear resistance ratings that can be found according to both international (ISO) and European (EN) standards. It is 5 times more cut resistant than Kevlar that is used in bullet proof vests. The Cut-Tex material that is used to make the Flak Sack is 5 times more cut resistant than Kevlar and the strap almost impossible to cut or break without the use of heavy tools. 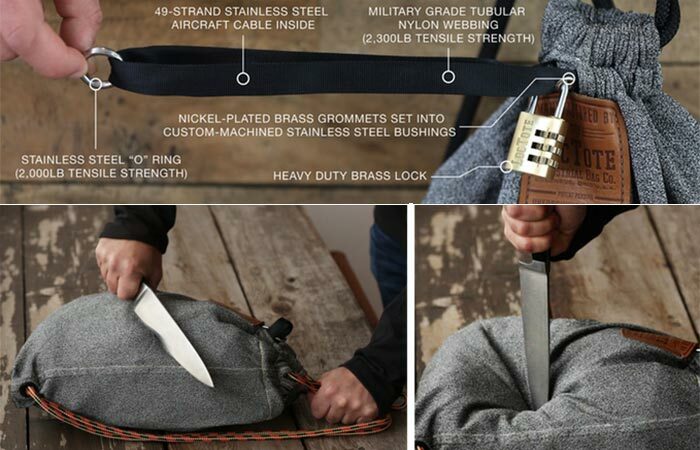 The Flak Sack offers a drawstring that you close and lock and that’s it. The lock-strap is created out of nylon that has been reinforced with stainless steel components and 49 strands of stainless steel wire that makes it nearly impossible to cut, tear or break without heavy duty tools. The strap has been tested to over 1000lbs and still held up. You can lock your Flak Sack up and not worry about it. 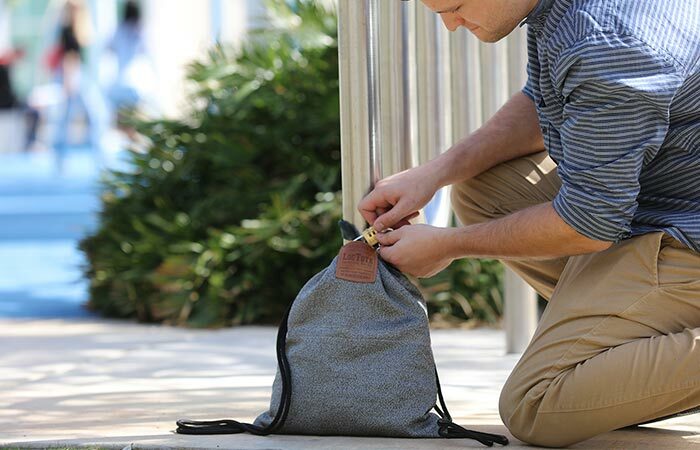 Apart from that, the Flak Sack also includes RFID blocking technology so that you are safe from electronic theft, has balanced drawstrings and includes a waterproof pocket for all your electronic devices and gadgets. Even though the Flak Sack is the most cut resistant bag on the market, it is still soft and comfortable and looks good as well. Check out the video below. The Flak Sack is not only comfortable but packed with features as well. 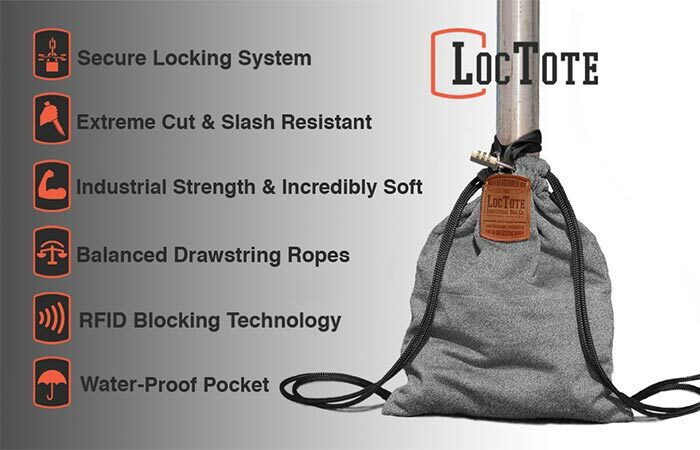 The guys at Loctote started a Kickstarter campaign for the Flak Sack and smashed their $18,000 goal and are already standing on $712,856 but you need to jump if you want to get your own Flak Sack at a discounted price. You can purchase the Flak Sack in both Steel Grey and Sunsplash Orange.